World Wetlands Day is held on February 2nd annually to celebrate the 1971 adoption of the International Convention on Wetlands in the Iranian City of Ramsar. Each year there’s a new theme for World Wetlands Day and events are held throughout the country. This year the theme is Wetlands and Climate Change, to draw attention to the vital role of wetlands as a natural solution to cope with climate change. The frequency of disasters worldwide has more than doubled in the past 35 years, with even more extreme weather predicted going forward. Most climate scientists agree that the main cause of climate change is increased amounts of greenhouse gases (including carbon dioxide) in the atmosphere, trapping heat from the sun. The level of carbon dioxide in our atmosphere has increased 40% since pre-industrial times, released from burning fossil fuels like coal and oil mined from the earth or seafloor. Where did those fossil fuels form? In wetlands! Even today healthy peat wetlands remove carbon dioxide from the atmosphere and store it underground, indefinitely. While trees are held up as carbon heroes, wetlands are in fact the most effective carbon sinks on Earth! Peatlands cover about 3% of our planet’s land and store approximately 30% of all land-based carbon – twice the amount than all the world’s forests combined. Trees do store carbon, but only until they die and decompose. New Zealand peatlands have been found to be year-round permanent sinks for carbon dioxide. Wetlands are climate champions. So, on Feb 2nd, grab some friends or family, go visit a wetland, and thank it for being a natural solution. Vote for your favourite photo in the international photo competition. There’s a stunning range of images submitted, and even a few from New Zealand. Join the National Wetland Trust and NZ Landcare Trust in Ohaupo to hear about the many groups and volunteers restoring Waipa Peat lakes. Join Forest and Bird in West Auckland to enjoy their wetland restoration and a chance to see pateke/brown teal. Join a farming family to release trees planted in their wetland restoration site on their property 20 mins drive from Cambridge. 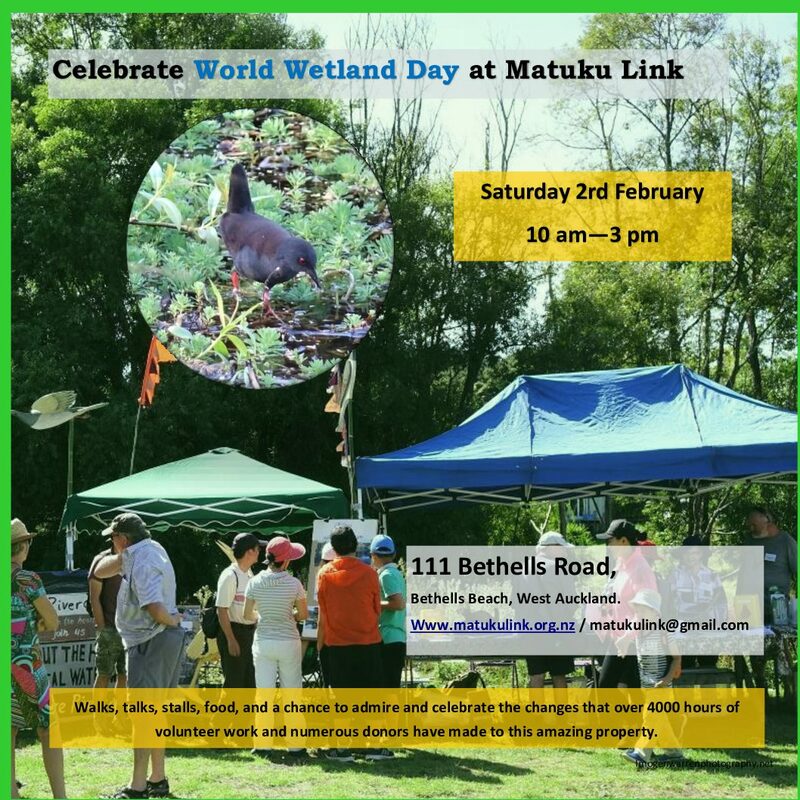 Join us at Brooklands Zoo to celebrate World Wetlands Day! At 10am Puke Ariki's children librarians are running a wetlands themed storytelling session. Free bus tour to beautiful lakes Rotoroa and Rototuna in the Kaweka Forest Park, organised by Biodiversity Hawke’s Bay, the Department of Conservation and NZ Landcare Trust. In Celebration of World Wetland Day – free guided walk from the Education Centre to the southern end of the wetland followed by a BBQ. 10 am start. Join DOC rangers for a stroll to a regenerating local wetland area and learn a little more about why these sites are so important for biodiversity. Free kayak tours operated by the Department of Conservation. Help combat the spread of invasive willows - something for every skill level. Free lunch and social time for all volunteers afterwards. Discover the mysteries of Wairarapa Moana Wetlands. Follow the clues along the shoreline. Along the way you’ll meet experts on the fish, birds, plants and history that make the area so special, and see some live demonstrations. Discounted tours all weekend! Enter our multi-species predator-proof fence and find out how we keep the wetland pest-free. The wetland is also home to a breeding pair of flightless takahē.